Assessing students is only possible if they have been working toward a clearly stated objective; one that both the teacher and student fully understand, with all of its requirements and implications. A good objective includes a statement of what the student will have gained once the objective is met, and how the student will prove that he or she has met the objective. How the student will provide proof is the means by which student work will be assessed. A teacher might say, “I know that you understand appoggiaturas, because you have given me an accurate definition, you have performed one correctly, and you have appropriately interpreted the notes involved.” A student who can only give a definition knows what an appoggiatura is, but cannot apply that knowledge to performance or interpretation, and therefore has an incomplete or even irrelevant understanding. What good is it to have knowledge that cannot be put to use? Squidward happily interpreting on his clarinet. By this we can see that in doing something observable and measurable, the student not only makes it possible for the teacher to assess the work, it also helps the student apply and find relevance in what has been learned. Well done objectives and assessments (and I hope by now we understand the two must go hand in hand) are an essential component of effective teaching and learning. To help in writing lesson plans with clear objectives, certain terms from the national arts standards must be understood. I will discuss those words in the remainder of this article. The first component in both responding and performing processes is to select repertoire. For performing, the authors of the standards explain that to select is to “choose music for performing, rehearsing, or responding based on interest, knowledge, ability, and context.” Context is defined as the “environment that surrounds music, influences understanding, provides meaning, and connects to an event or occurrence.” It is a simple matter to choose one’s favorite song, or one that is most familiar, for responding or performing. It is quite another thing to choose a song after considering what one knows about it, what performing abilities one has, and for whom and for what purpose the performance will be given. With those criteria in place, the student must give the selection more careful thought, and may need to discard that favorite song or think of other choices that would better meet more of the criteria. Those additional criteria, beyond simple preference, set up a learning environment for deeper learning and understanding that will be demonstrated by the selection made, and the support from evidence, drawn from interactions with the criteria, explaining how and why the selection was made. Another important word for us to understand is interpret. Students develop an interpretation for their own performances, and determine a composer’s and performer’s expressive intent through interpreting music. Interpret is to “determine and demonstrate musics expressive intent and meaning when responding and performing.” This definition immediately leads us to define another word, and that word is “demonstrate.” How will a student demonstrate expressive intent and meaning? To demonstrate is to “show musical understanding through observable behavior such as moving, chanting, singing, or playing instruments.” Notice talking or writing about music is not given as an example of demonstrating, nor should it be. Aaron Copland in What To Listen For In Music wrote, and I agree, that meaning of a musical work cannot be fully, adequately, or accurately described in words. Musical meaning is experienced and personal. It is manifested in feelings, emotions, and physical responses that quickly exceed the capacity of words to represent or convey. When a person demonstrates musical meaning, they must rely on the observer relating to the outward expression of that meaning, making it a shared meaning seen and heard through artistic gestures. The responses of moving, chanting, singing, or playing instruments are artistic actions that give voice to expressive intent and meaning, and allow the student him or herself to create an expressive intent, if only in passing along their response to an observer. Responding in this way is a kind of second hand performance. Unlike the original performance to which an audience is listening, which is a single one, response performance to the single original is plentiful, because each audience member is a response performer giving a personal and unique interpretation and meaning to the original. The same is true for performers interpreting a musical work. Though many orchestras or soloist may perform the same symphony or sonata, each performer will demonstrate a different though perhaps similar expressive intent through interpretation. It is only when the music is performed, original or response, that interpretation can be assessed. For the typical American student, class time is spent doing things individually or in small groups. Students are used to activities such as watching and listening to a teacher’s presentation, reading aloud or silently, doing a writing assignment, math problems, or science experiments. Although everyone in the class is doing something, the class is not doing anything active together. The students are not reading aloud in unison, reciting math facts in unison, or doing the science experiment with whole-class collaboration. Students may all be doing the same or similar things, but they are each doing the thing independently of other students or small groups. 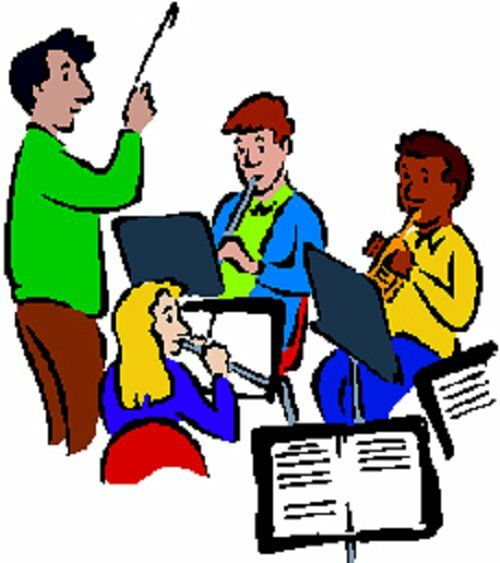 With all of these differences between what students do in their other classes and what they do in their music ensembles, it should not be surprising that it is at times necessary to teach students how to rehearse, and how rehearsals work. 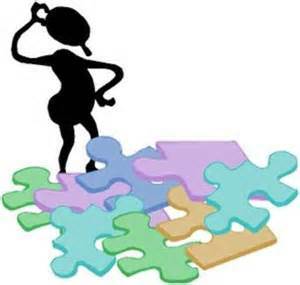 Students who try to apply learning strategies that work in other classes, such as collaborating with other students and doing independent reading, may not be appropriate or even helpful in a full rehearsal. Because both student engagement and the teacher’s instruction are ongoing, creating an environment of constant and active give and take between students and teacher, students who veer off into independent work will often quickly miss important segments of instruction and learning. 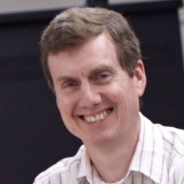 Small group and independent work is certainly a component of music study, but often special “sectional” rehearsals need to be planned, or individual practice needs to be carried out for these strategies to be effectively employed. More often, students need to realize that in music, they most effectively learn by doing, and the doing is the active involvement in music making, an activity that is instantly accessible by all in the room. Students don’t need to share what their thoughts are; when they play the music, the product of their work is already made known. When students respond to questioning, they are likely evaluating what they or others have performed, or proposing an interpretation that is informed by what they have learned about the music through performance. The focus is more on what they have done as an ensemble, and less on what they have achieved individually. Each student’s accomplishments are immediately needed and valued by the group in a way that they are not in other academic areas. With all of this in mind, I will end with a few observations on what students need to know about rehearsing. First, students need to become accustomed having no down time. Active participation and engagement is demanded by the very nature of music and a rehearsal. Second, everything they do matters to everyone else in the room. Each student’s work is not just about his or her own grade or success; it is about everyone’s success and enjoyment of the music being made and all the benefits that come with music making. Third, the social aspect of music ensembles is important, but not in the sense of socializing. The social aspect of music ensembles is found in the close integration of what each member of the group is doing. Fourth, the greatest success and growth can be realized in an environment characterized by the greatest cooperation and unity of action and purpose. These points easily come down to not only musical training, but character development. Caring about others and the greater good while foregoing personal desire to disconnect with one or two friends, and finding greater reward and satisfaction in the greater achievements of the group, which are simply not possible on an individual basis. When these principles are front and center with music ensembles, the results are better music and better living. Recently, I attended a chamber music concert that included the first of Beethoven’s “Razumofsky” string quartets, the Op. 59, no. 1. The performance was by an ensemble made of advanced musicians from prestigious music conservatories that had gathered to attend a music festival. As the performance got under way, I quickly became unsettled. I couldn’t quite grasp the meter, even though I knew it was in common time. Eventually, the meter sorted itself out in my perception, but wondering what was causing my confusion distracted me. A day later, I have discovered that there are indeed metrical elements in this quartet that pose a challenge to those who perform it, and that this student ensemble did not always meet those challenges. 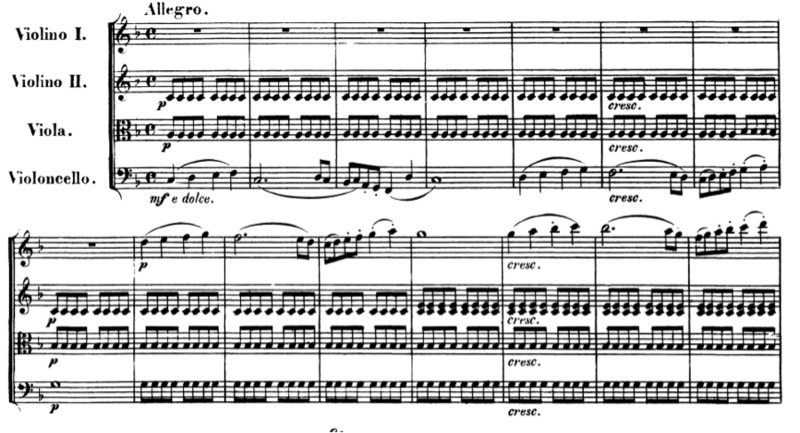 Looking at the score, It interests me to examine the opening theme, and see why the meter was so illusive. Through enculturation, we become accustomed to perceiving meter through certain cues composers place in their music. 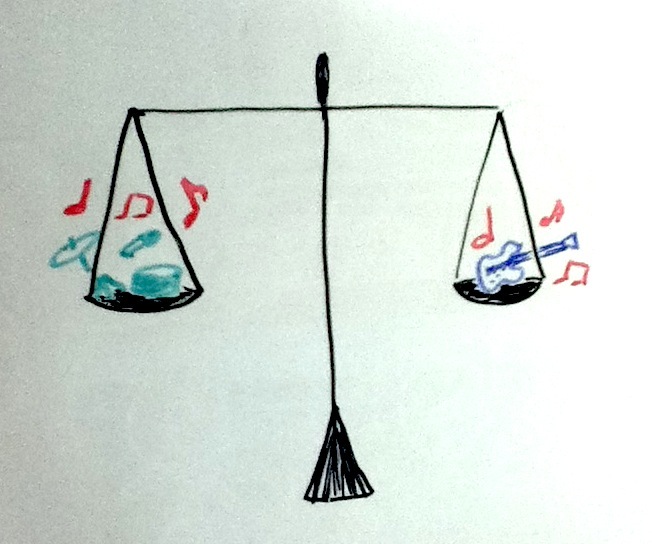 Because meter is a pattern of strong and weak beats, the listener must have some way of knowing which beats are strong. One such cue is that usually, chord changes occur on strong beats. In the opening bars of this Op. 59, no. 1, there is a harmonic ostinato, and when it finally ends in the seventh measure and a chord change occurs it is not on the downbeat, but on beat 3 in common time. It is no coincidence that this is the very spot where my sense of meter began to falter. It was here I began to doubt I was hearing common time, and became persuaded that it was instead two-four meter. To deepen my doubt, at that exact same spot, there is the start of a relatively long duration, which is another cue for strong beats. This happens at the beginning also, but when we get to that same seventh measure, two quarter notes follow four eighth notes. In other words, both a chord change and a longer duration occur on beat three. Yet another cue for perceiving meter is the onset of a relatively long articulation. At the very beginning, with the second violinist and violist playing the steady eighth-note ostinato, the entire burden of establishing metric structure falls to the cellist. The longest slur, one and a half measures, is in the third and fourth measures, beginning on the third beat of the third measure. Not only that, but this relatively long slur also starts on a harmonically strong pitch, the tonic, giving that third beat even more weight. As a result this third beat, like the one in the seventh measure, can easily be heard as a downbeat. Interestingly, Beethoven does not articulate the parallel occurrence of this theme the same way. When the first violin plays the same melody staring in the ninth measure, the slur has been shortened, so that the new relatively long slur does begin on a downbeat, supporting the perception of quadruple meter. So what is a player to do in order to overcome these ambiguities? Phrasing and interpretation become essential. The first step is to be aware of the challenges present in the music. Beethoven was moving into his middle period when this quartet was composed, and here, as in the Eroica Symphony, he was experimenting with metric ambiguities. Although I will only be discussing those in the opening bars of Op. 59 no. 1, they are found throughout the work. To be effective, these devices must be set in relief against a well-established metrical structure. The cellist playing this quartet must be certain to inflect the opening phrase so that a tactus at the half-note level is established. The tactus in music is the pulse listeners perceive as the beat of reference. It is the steady beat a conductor indicates and to which a listener is apt to move. If the listener is perceiving the half note as the tactus, then the irregularities of articulation and chord changes will be perceived for what they are meant to be—essentially, syncopations. With a half note tactus, the pattern of strong and weak beats at the whole note level (each measure equaling one beat) comes off as first strong and then weak. The relatively long notes fall on strong half-note beats, and the longest note of the theme, the whole note in the fourth measure, is rightly heard as the ending note of the phrase. With a quarter-note tactus, the dotted half note that begins the second measure takes on more prominence, and the first measure sounds like a weak measure dominated by the ensuing dotted half-note event. The quarter notes in the first measure must be handled expressively so that the dotted quarter that immediately follows them sounds like closure to the first sub-phrase, and likewise with the two quarter notes in the third measure followed by the whole note. Although this is somewhat counter-intuitive, it is an essential part of Beethoven’s rhythmic structure at this point in the work. Beethoven’s indication of “e dolce” serves not only as an expressive marking, but as a practical matter for helping to establish the meter. Finally, the cellist must be sure to play the last note of the theme, the whole note in the eighth measure softly, even though it is completing a phrase that has up to this last note been played with a crescendo. The inception of a relatively long dynamic usually occurs on a strong beat, and the piano dynamic at measure nine is an example of this. During the early moments of the performance I attended, these important points were not observed. The cellist played in a steady tone and dynamic that concealed the metric nuance I needed to grasp the metric structure. My experience with that performance and my subsequent reflections on it highlight the importance of analysis and interpretation to good performance preparation. Though the players competently played the pitches and durations in the score, their weakness was not paying enough attention to analysis and interpretation, and realizing their importance to a successful performance. This is the lesson for us as we study scores and then teach repertoire to our students. Analysis and interpretation are not just academic exercises; they are integral parts in the performance process and cannot be overlooked. Remember, an audience rarely sees the score, they can only hear the music. Metrical form is more than time signatures and bar lines, for an audience see neither. Metrical form is a musical structure that must be perceived aurally, and therefore placed into the musical surface, beyond what the musicians see in their scores. Meter is not self-evident to an audience or even to the performers. It must be felt, perceived, and communicated.